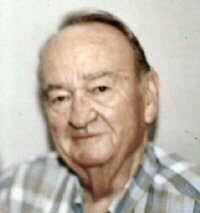 Mr. Benson was born March 15, 1922, in Wellington to J.R. and Eula Anderson Benson. He graduated from Shamrock High School in 1939. He attended Texas Tech University until he joined the Army Air Corps during World War II. He was a B-29 pilot in the Pacific Theater. In April 1944, he married Lurline Smith. They were married for over 60 years. Mr. Benson had a daughter, Sue Benson Campbell and a son, Gray; one grandon and two great granddaughters. Mr. Benson was a long-time businessman in Shamrock, having taken over the family business in 1945. His father, J.R. Benson, began the furniture, hardware and implement business in 1923. Lyman later sold carpet and became a real estate broker. Mr. Benson was a charter member and past commander of the American Legion, a charter member of the Shamrock Booster Club, a member of the VFW, and a 50-year member of the Masonic Lodge. Lyman Benson, died Monday, Oct. 11, 2004, in Amarillo at the age of 82.